The biofuels industry gained significant traction in early April in the fight to secure year-round E15 sales by receiving a commitment from a critical stakeholder: President Trump. 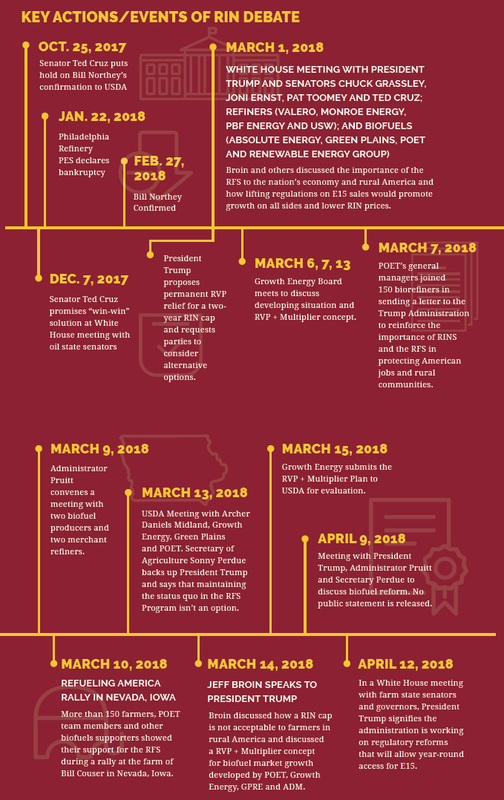 In a White House meeting with farm state senators and governors on April 12, President Trump signified the administration is working on regulatory reforms that will allow year-round access for E15. Currently, Environmental Protection Agency (EPA) regulations limit the sales of E15 by retail gas stations during summer months. Biofuels industry leaders from POET, Growth Energy and others expressed widespread enthusiasm for Trump’s statement of support. The biofuels industry has long advocated for RVP relief because of the benefits it would provide across the board to farmers, consumers and biofuel producers. With RVP, nationwide adoption of E15 could drive demand for an additional 2 billion bushels of surplus grain annually. White House discussions around RINs and the RFS ramped up beginning in late 2017 after Sen. Ted Cruz (R-Texas) proposed a 10-cent cap on RINs. The biofuels industry made it clear to the White House, United States Department of Agriculture (USDA) and EPA that Sen. Cruz’s “RIN Cap” proposal was unacceptable. It would destroy incentives for refiners to blend homegrown biofuels, jeopardize thousands of jobs and family farms across the Midwest, and further reduce demand and prices for U.S. grain. From meeting twice with President Trump to having ongoing dialogue with our Senate champions, POET has been a leader in conversations to stress the importance of higher biofuel blends and the RFS to the nation’s economy and rural America. During discussions at the White House, POET has promoted the benefits of an RVP waiver to all sides. A permanent RVP waiver for E15 would give Americans year-round access to E15 and generate more RINs, thus helping lower compliance costs for merchant refiners. “Securing year-round E15 sales has been a focus of our meetings with the President and the Trump Administration. It’s clear that we helped raise awareness of E15 and RVP relief. Year-round E15 sales would create more demand for the feedstocks we use to produce biofuels. RVP would grow the market for biofuels and increase demand for surplus grain. It’s a clear win-win-win for America’s farmers, biofuel producers and merchant refiners,” Gilley said. Biofuels industry leaders have worked collaboratively in response to White House and Trump Administration requests in order to advance RVP relief. Before Administrator Pruitt issued refinery waivers, industry leaders responded to White House and USDA requests to evaluate solutions that would grant RVP relief while lowering RIN compliance costs for refiners. POET, along with Growth Energy, Green Plains Renewable Energy and Archer Daniels Midland, developed the RVP + Multiplier concept for biofuel market growth. However, Pruitt’s actions now have negated the industry’s interest in offering further relief to refiners. The focus now, biofuels industry leaders say, is to hold the EPA accountable to the President’s commitment to RVP relief.